Brooklyn Raga Massive is a collective of forward thinking musicians rooted in or inspired by the classical music of India. 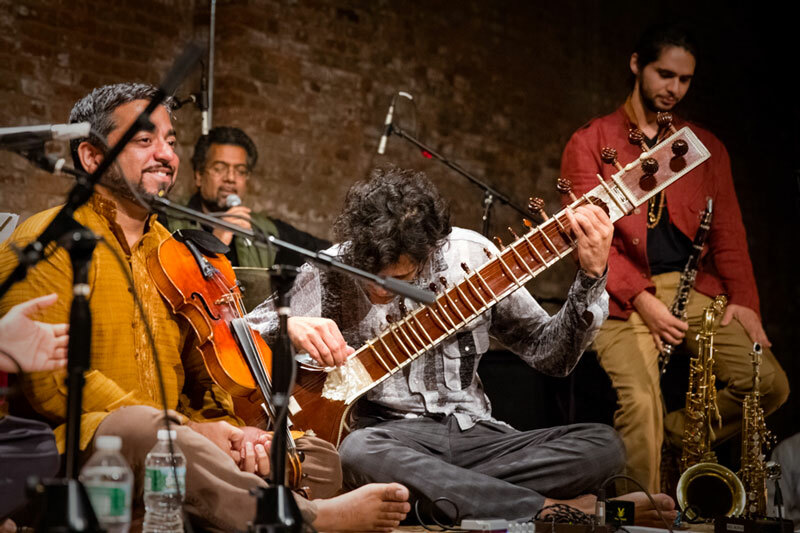 For almost 4 years, the Brooklyn Raga Massive has held a weekly concert series and jam session, featuring classical Indian performances and experiments with contemporary music and world music traditions. The inclusive and spontaneous sessions have created a strong community of world class musicians and dedicated fans, and has been an incubator of new genres of music indigenous to Brooklyn. BRM’s Pioneer Works residency will consist of multi-disciplinary performances, recording sessions, educational offerings and podcasts. For every Wednesday in February, March and April, BRM will bring their weekly series to Pioneer Works with greatly expanded programming. The recording studio at Pioneer Works will be utilised by BRM each week as their members engage in a collaborative composition project. These studio recordings, in addition to live concert recordings from the whole residency, will be used to create a new BRM compilation album defined by its collaboration with Pioneer Works. Video from the concerts, studio and interviews will comprise a documentary film and video shorts, further defining this bold partnership.